On January 15 2009, US Airways Flight 1549 was tasked to fly an Airbus A320-214 from New York’s LaGuardia Airport to a stopover at Charlotte Douglas International Airport. After multiple bird strikes caused both engines to fail. Pilots Captain Chesley ‘Sully’ Sullenberger and First Officer Jeffrey Skiles were forced to make an emergency water landing in the Hudson River. They safely glided the plane to ditch and all 155 passengers and crew aboard the plane survived although several occupants suffered injuries, a few of them serious and required hospitalization. The incident has now been dubbed as the “Miracle on the Hudson”. Captain Sullenberger and the crew have been hailed as heroes. In true Hollywood fashion, they have now gotten their claws on this fascinating tale and have named it “Sully”. The Hollywood account of this event is directed by the Legendary Clint Eastwood who up to this point has a number of great films under his belt (American Sniper, Invictus, Gran Torino & Million Dollar Baby just to name a few) and it stars two-time Academy Award winner Tom Hanks as the eponymous Sully backed with an impressive cast with the likes of Aaron Eckhart, Anna Gunn, Laura Linney, Autumn Reeser, Holt McCallany, Jamey Sheridan and Jerry Ferrara. This biopic starts after the events of the aforementioned “Miracle on the Hudson” with the only change being that they were no serious injuries. Sully now has to deal with the pressure of being hailed as a hero by the public and the press for his unprecedented feat of aviation skill. He also has to deal with the fact that his career is on the line, as he has to deal with intense scrutiny from the National Transport Safety Board (NTSB) who has conducted an investigation on his actions, as they believe they could have made it to the airports. Sully now has to defend himself and convince the board that they would have crashed if he tried to go to the airport. With that in mind lets take a look at the pros and cons of this picture. Tom Hanks once again shows us why many regard him as one of the greatest actors in Hollywood. 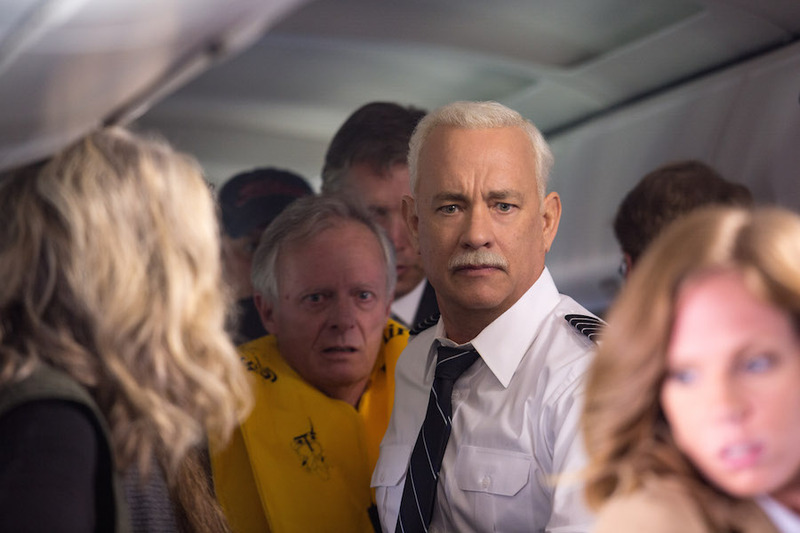 His turn as the eponymous Sully is a very human like performance. In typical Hanks fashion he gives a layered performance that makes us forget that we are actually watching an actor, this is achieved thanks to the fact he comes to the film with snowy white hair and moustache. He gets to depict the main character as one who is extremely self-assured in his ability and one who is also humble as he is not particularly fond of the hero-worshipping he is receiving from the US media and members of the public. He also shows vulnerability as he constantly re-lives the moment and is constantly pondering with his wife who is played by Laura Linney if his action of landing the plane in the Hudson was the right decision. Sully is at its best during the film’s sombre moments. 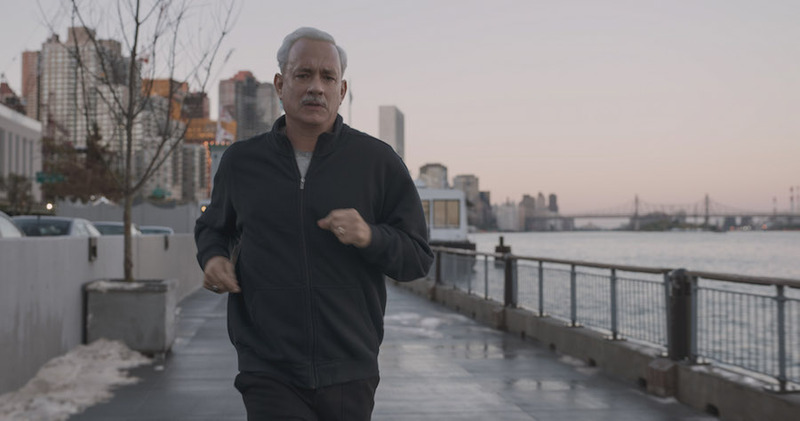 In these moments we see Sully peacefully jogging around the cold streets of New York City. These scenes are backed with great mood-setting shots and soothing music from Sutton Band, Christian Jacob and Clint Eastwood. It also allows Sully and to a certain extent the crowd to reflect on the events that has occurred and allows us to think about things like life in New York after the 2008 economic recession and 9/11 and the worlds interpretation of Heroism after these harrowing times. In a film featuring co-stars like Laura Linney and Breaking Bad Alumni Anna Gunn, the co-star who sticks out the most in this biopic is Aaron Eckhart, who portrays First Officer Jeffrey Skiles. He gets to act as a great foil to Sully’s extremely professional attitude as he provides some of the film’s funniest lines of dialogue through his witty banter and he also handles the situation and attention they are receiving from the press better than Sully is and also helps to humanize him in the process. I really like the questions the movie raises with the NTSB making an inquiry about the flight. It raises the question of whether Sully could have prevented this situation and what the outcome would have been if he had simply followed protocol. What makes this part of the story fascinating is that its get the crowd asking the same questions as well. Sully who is suffering post traumatic stress disorder from the flight imagines the outcome of the flight if he had taken a different turn too many times and it becomes a bit repetitive. The only thing that prevents these repeated visions from being completely dull is that it is shown from different angles and perspectives. The NTSB investigators are unnecessarily vilified to increase the drama and to help fill out the feature-length duration. They were depicted as harsh prosecutors so that the film could get a courtroom drama-style conclusion that doesn’t feel like it was deserved (even though it was a good scene). I believe that this depiction stirred a bit of controversy as lead investigator John Balzano believed they “weren’t out to embarrass anybody” and a former investigator also said that he believed that moviegoers would take their depiction as evidence of “Government incompetence”. Even the real Captain Sully felt that the real-life investigators were not prosecutors and it was not fair to associate them with changes in the story depicting “more of a prosecutorial process”. 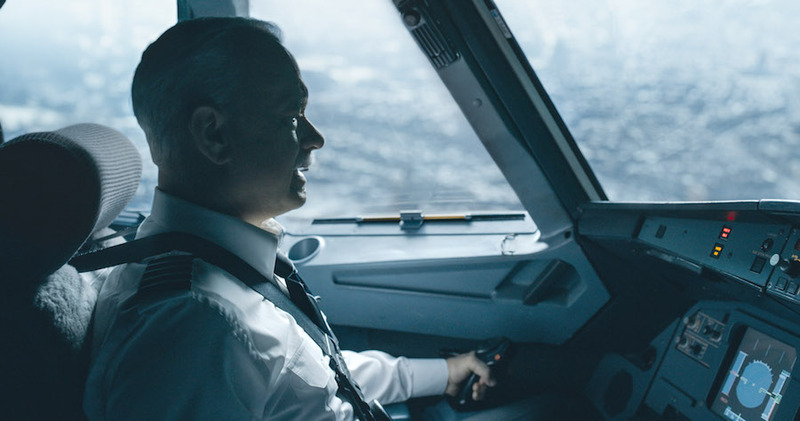 The interactions between Tom Hanks and his wife portrayed by Laura Linney is relegated to phone calls that are not as emotional as the film’s quieter moments and like Sully’s various flashes of potential outcomes of the flight begins to become repetitive. Laura Linney does best with the role but unfortunately it’s not really a great showcase of her acting ability as she can only move around the house and talk on the phone and maybe shed a tear or two. I guess these scenes were added to show he is a family man. The movie also shows flashbacks of Sully’s past as a kid learning how to fly and his days in the Air Force whilst these are interesting titbits that show where his love of flying came from, the way they are woven into the picture is weird and in my honest opinion feels like it doesn’t add much and it was integrated to add extra screen-time in one of Clint Eastwood’s shortest movie to date. Sully is at its best when it is quiet. Sully is a great character study on an everyday hero that is blessed with another awesome performance from Tom Hanks and his co-star Aaron Eckhart. Unfortunately a few moments of repetition, unnecessary padding and over -dramatization of events prevents this biopic from being a classic. At the end of the day it’s a great watch.